QVC (an acronym for "Quality Value Convenience") is an American cable, satellite and broadcast television network, and flagship shopping channel specializing in televised home shopping that is owned by Qurate Retail Group. Founded in 1986 by Joseph Segel in West Chester, Pennsylvania, United States, QVC broadcasts to more than 350 million households in seven countries, including channels in the UK, Germany, Japan, and Italy, along with a joint venture in China with China National Radio called CNR Mall. QVC was founded on June 13, 1986, by Joseph Segel. One of the first brands to sign a two-year deal with QVC for its products was Sears. The corporation later set a new record for first full-year fiscal sales for a new public company of $112 million. Initially broadcast live from 7:30 p.m. until midnight ET each weekday and 24 hours a day each weekend, the channel extended its live programming to 24/7/364 in January 1987. In 1989, QVC acquired its top competitor, the Cable Value Network (CVN), founded by Irwin L. Jacobs. The $380 million deal contributed to a loss of $17 million during the next fiscal quarter, and then led to difficulties in the couple of years that followed. On February 2, 1995, Comcast purchased a majority shareholder stake in QVC, Inc., taking control of the corporation. That year, QVC kicked off the "Quest for America's Best: 50 in 50 Tour," a 50-week nationwide product search. Q2, a separate channel for more upscale shoppers, was founded in 1994 but abandoned in 1996. QVC.com was started in 1996 as iQVC. In 1998, two former hosts filed a class-action lawsuit against QVC, claiming that they were discriminated against by the shopping channel based on their race. The lawsuit went on to state that QVC refused to allow non-white hosts any permanent daytime/primetime spots, which relegated them to the overnight hours, otherwise known as the "graveyard shift." Because of this, the non-white hosts were paid considerably less than the white hosts. In July 2003, Comcast sold its majority share to Liberty Media. On September 23, 2007, QVC U.S. rebranded itself, changing its logo on-air and online. The rebranding was accompanied by an advertising campaign with the tagline "iQdoU?" ("I shop QVC, do you?") that had preceded the rebrand with billboards in major U.S. cities. The iQdoU? campaign also included a "teaser" website. QVC was the first shopping network to offer a native high-definition simulcast channel in May 2009. The 4:3 cut for its standard definition feed in this 16:9 presentation is made to the right of the screen rather than on both sides of the 4:3 frame, allowing the network to place its graphics fully to the left and lower portions of the screen to maximize camera presentation space. On September 30, 2010, at 11 p.m., QVC began broadcasting in Italy, both on satellite and through digital terrestrial television. In 2012, QVC partnered with China National Radio to take over operations of its home shopping network and associated internet e-commerce site. Its initial reach was reported to be 35 million households. In 2013, QVC partnered with Ion Media Networks to bring its programming to broadcast television, through Ion Television. QVC began to be carried as the fifth digital subchannel on most Ion Television owned-and-operated stations beginning on August 5, 2013; due to technical limitations caused by the number of subchannels Ion requires its stations to carry, QVC is carried in a squeezed full-screen 4:3 format and is transmitted in standard definition. The channel is also broadcast on digital subchannels of low-powered television stations in selected areas. The broadcast service is branded as "QVC Over the Air", with an accompanying on-screen bug appearing on the lower right corner of the screen during the network's programming. In August 2015, QVC acquired the online retailer Zulily for $2.4 billion. On July 6, 2017, QVC's parent company, Liberty Interactive, announced its intention to purchase the remaining 62% of stock it didn't already own of HSN, the rival home shopping channel. The all-stock deal is valued at $2.1 billion ($40.36 a share). On August 22, 2013, QVC launched a timeshift channel called QVC Plus (the first such channel operated by a home shopping network), made available initially on cable provider Bright House Networks and satellite provider DirecTV, which broadcasts the channel's programming on a three-hour tape delay. On April 1, 2017, QVC Plus was rebranded as QVC2 as a destination for more live programming, now broadcasting live 12 hours a day, Monday through Friday from noon to midnight ET, and Saturdays and Sundays from 10am-10pm ET. On October 25, 2016, QVC announced the creation of Beauty iQ, a female-oriented television channel based entirely on beauty products. The network was launched on both DirecTV and Dish Network on October 31, 2016. Beauty iQ aired live programming Monday through Friday, 8pm- Midnight ET. Beauty iQ ceased live programming on March 13, 2019. On April 1, 2019, Beauty iQ was rebranded as QVC3, airing rebroadcasts of previously recorded QVC and QVC2 programming 24 hours a day. All of QVC's operations (U.S., UK, Germany, Japan, Italy, and China) run 24 hours a day, although live programming hours vary between each region. QVC has its headquarters in West Chester, Pennsylvania by U.S. Route 202. The $100 million QVC Studio Park complex, located on an 80 acres (32 ha) plot of land, opened in 1997. QVC's U.S. operations are based in the Studio Park complex, which houses its corporate headquarters, studio and broadcasting facilities. Studio Park is the former corporate offices of Commodore Business Machines. Call center facilities are located in Chesapeake, Virginia, and San Antonio, Texas. QVC's distribution centers are located in Lancaster, Pennsylvania; Suffolk, Virginia; Florence, South Carolina; Rocky Mount, North Carolina and Ontario, California. Its 2013 sales were worth $5.84 billion. 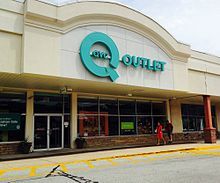 QVC U.S. also operates a retail store at their Studio Park complex, and two outlet stores in Lancaster, Pennsylvania and Frazer, Pennsylvania. QVC broadcasts live in the United States 24/7, 364 days a year to more than 100 million households, and ranks as the number two television network in terms of revenue (#1 in home shopping networks), with sales in 2015 giving a net revenue of $8.7 billion. The only day on which QVC does not broadcast its usual format is Christmas, when the station runs a taped telecast of the West Chester Christmas Parade and other pre-recorded programming. Every year the "QVC Presents 'FFANY Shoes on Sale'" event is broadcast in which donated designer shoes are sold at half the suggested retail price and 80% of the proceeds go to breast cancer research and education. It is organized with the Fashion Footwear Association of New York, which runs a coinciding Shoes on Sale initiative along with an awards gala. QVC UK was launched on October 1, 1993. QVC UK's headquarters and broadcasting facilities are in Chiswick Park, West London. Call centre and distribution warehouse are situated in Knowsley, Merseyside. QVC UK also runs two outlet stores, one in Warrington, the other in Shrewsbury. QVC UK also operates three channels made up mostly of rerun segments from the live channel, QVC Beauty, QVC Extra and QVC Style. The company's UK sales in 2013 were worth $660 million. QVC UK's main channel broadcasts live 364 days a year from 09:00 to 01:00. For the 8 'non-live' hours a day and on one day a year, Christmas Day, the main channel shows rerun segments from the live channel. QVC Germany, incorporated in Düsseldorf, runs call centre operations from sites in Bochum and Kassel, whilst distribution is handled from a dedicated warehouse in Hückelhoven. The company's 2013 sales were worth $970 million. QVC Germany broadcasts live 17 hours a day, 363.5 days a year (the channel goes off-air on Christmas Eve (with no programming after noon) and Christmas Day). QVC has two additional channels in Germany, QVC 2 and QVC Style. QVC Japan is based in Makuhari, where its corporate headquarters and call center facility are located. Distribution facilities are in Sakura City. The company's 2013 sales were worth $1.02 billion. QVC Italy was launched in October 2010. QVC Italy's headquarters and broadcasting facilities are located at Brugherio, near Milan. The company's 2013 sales were worth $130 million. QVC Italy broadcasts live 17 hours a day (although the channel runs 24 hours a day), 364 days a year. The primary distribution platforms for QVC Italy are digital terrestrial television and satellite. In the summer of 2015, QVC launched in France. Before the launch, the company said it expected to create about 200 jobs in its first two years in the country. QVC France broadcast from a studio center in suburban Paris live on weekdays from 15:00 to 23:00 and weekends from 11:00 to 23:00, online, on mobile devices and on major satellite TV, cable TV and internet TV. The channel's corporate website said QVC stood for: Qualité, Valeur, Confiance, replacing convenience with (the French for) confidence. QVC/CNR (China) is based in Beijing and operates both a television broadcast and associated e-commerce website cnrmall.com. The China operation is a 51/49 joint venture between state-owned China National Radio and QVC, based on the pre-existing CNR channel reaching 35 million households, with plans to grow to 195 million households that have digital cable. Chinese law prohibits private control of television stations, so this is the maximum position QVC can hold in its Chinese operations. QVC/CNR broadcasts live programming 12 hours a day and then replays the previous 12-hour segment. The company's 2013 sales were worth $110 million. ^ "History of QVC Inc". FundingUniverse. Retrieved February 3, 2013. ^ "QVC takes to French television sets for first time". Cosmeticsbusiness.com. 2015-08-04. Retrieved 2017-04-19. ^ "Sears Gets into Video Shopping". nytimes.com. 1986-11-15. Retrieved 2017-06-26. ^ "Biography". Home.comcast.net. 2 November 2007. Retrieved 3 February 2013. ^ Rozansky, Michael L. (2 February 1996). "QVC Is Making Plans To Change Its Second Channel: The Channel Had Sought To Appeal To Younger, More Affluent Shoppers; It Failed To Meet That Goal". Philly.com. Retrieved 15 February 2015. ^ Archive.org, QVC.com on 22 December 1996. ^ Sean Sexton. "Lawsuit Alleges Pattern of Racism at QVC - Direct Marketing News". Dmnews.com. Retrieved 3 February 2013. ^ "QVC official denies any racism A suit contends Jack Comstock treated minorities badly. He told the jury about his criteria for hosts. - Philly.com". Articles.philly.com. 7 June 2004. Retrieved 3 February 2013. ^ "Press Releases - Philadelphia Business Journal". Philadelphia.bizjournals.com. 23 September 2007. Retrieved 3 February 2013. ^ "QVC to Acquire Rival HSN for More Than $2 Billion". The Wall Street Journal. 6 July 2017. ^ "QVC buying longtime rival Home Shopping Network in deal valued at $2.1 billion". CNBC. 6 July 2017. ^ Isidore, Chris (6 Jul 2017). "QVC buying rival Home Shopping Network". CNN Money. Retrieved 6 July 2017. ^ QVC Launches Second Linear Channel, Multichannel News, 23 August 2013. ^ "Affiliate Distribution & marketing A Subsidiary of QVC". ^ "Directions to QVC Studio Park." QVC. Retrieved 11 August 2010. ^ "West Goshen township, Chester County, Pennsylvania Archived June 8, 2011, at the Wayback Machine." U.S. Census Bureau. Retrieved 11 August 2010. ^ "Touring QVC'S Scene Of The Sale \ Entertainment and Retailing Meet in West Goshen Twp." The Philadelphia Inquirer. 17 August 1997. D01 Business. Retrieved 11 August 2010. ^ "QVC presents "FFANY Shoes on Sale" 2016". jimmyfund.org. Retrieved 21 February 2016. ^ "Best Foot Forward: 16th Annual QVC Presents "FFANY Shoes on Sale"". jimmyfund.org. 22 September 2009. Retrieved 21 February 2016. ^ Jennie Bell (22 October 2015). "QVC Will Broadcast Its 'FFANY Shoes on Sale' Telethon Tonight". footwearnews.com. Retrieved 21 February 2016. ^ Chloe Melas (16 September 2015). "Cheryl Burke Teams Up With QVC To Fight Breast Cancer In A Fashionable Way". hollywoodlife.com. Retrieved 21 February 2016. ^ "QVC expands into France". The Retail Bulletin. 2015-08-05. Retrieved 2017-04-19. ^ Qurate Retail Group to Cease Operations of QVC France Effective March 13, 2019 - PR Newswire, 11 March 2019. Retrieved 1 April 2019. ^ QVC expands in China through joint venture - MarketWatch, New York, 20 March 2012. Retrieved 9 May 2015.